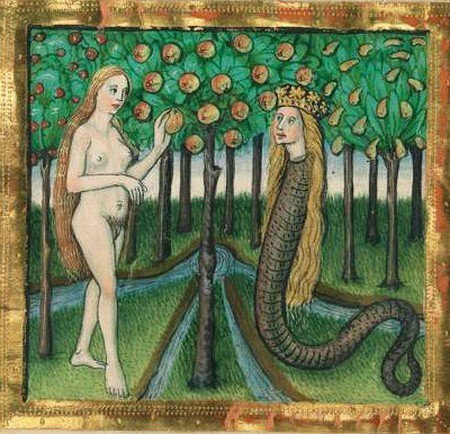 The story of how the serpent tempted Eve used to puzzle theologians. How did it speak to her? And when God cursed the serpent to "crawl on its belly" in future, did this imply that it originally had legs? This mediaeval illustration answers one of these problems, by giving the serpent a human face: a rather feminine one, with long hair and a magnificent crown. Why? A cherub's face; a reptile all the rest"